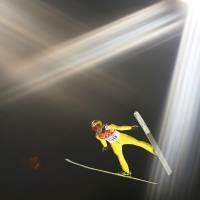 SOCHI, RUSSIA - Noriaki Kasai put years of frustration behind him by capturing the silver medal in the invidual large hill jump at the Sochi Games on Saturday night. Kasai’s total in the two-jump event at the RusSki Gorki Jump Centre was 277.4, just over a point behind gold medalist Kamil Stoch of Poland who won with 278.7. 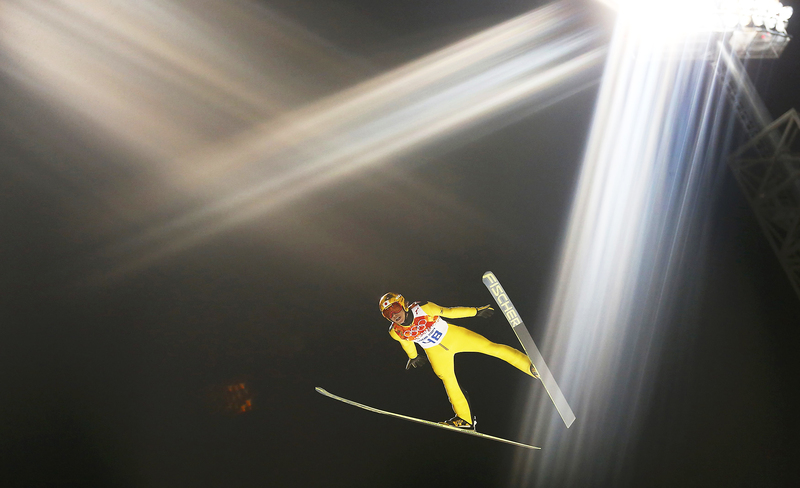 The 41-year-old Kasai, already a legend in the sport, is participating in his record seventh Olympics as a ski jumper. 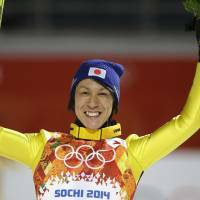 The closest the Hokkaido native had come to medaling in an individual event previously was some 20 years ago at the Lillehammer Games, where he finished fifth in the individual large hill jump at the age of 21. Kasai was at a loss for words afterward. Kasai came in eighth in the normal hill jump here on Feb. 9. The medal is Kasai’s second as an Olympian. He also earned a silver in the team large hill jump in Lillehammer. 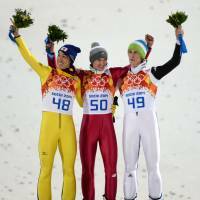 In making the podium again, Kasai became the oldest Olympic medalist in ski jumping, breaking the mark by more than five years. The previous record was held by Norway’s Birger Ruud, who was 36 when he took the silver at the 1948 St. Moritz Games in Switzerland. 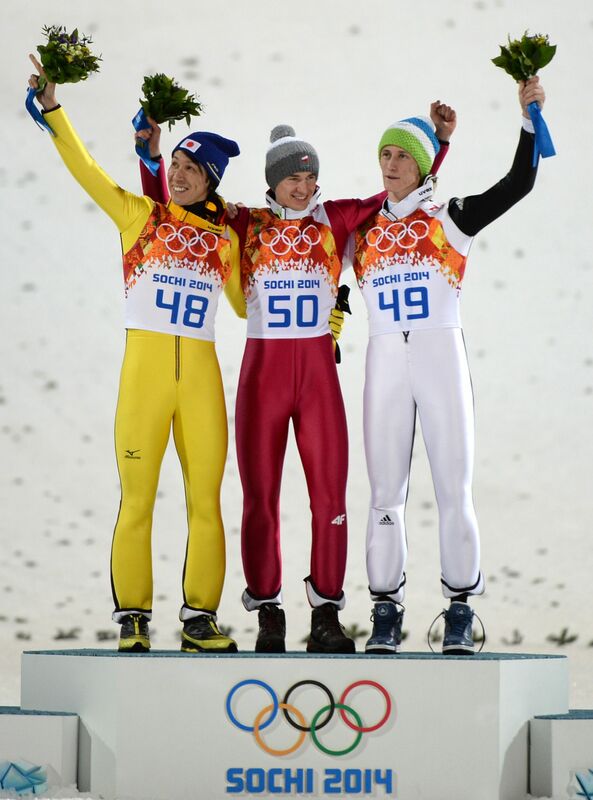 Just to put Kasai’s achievement in perspective, gold winner Stoch is 26, while bronze medalist Prevc is 21. When asked how he can still compete at his age, Kasai said desire filled his drive to continue. Kasai first jump was a thing of beauty, as he soared 139.0 meters with great form, and stood in second heading into the final round. His second leap was 133.5, which was good enough for him to remain in second place. Stoch went 139.0 in his first jump and 132.5 with his second to hang on to first place. Stoch received slightly higher scores from the judges. The medal was the second for the Pole in Sochi. He also won the normal hill jump. Daiki Ito (252.5 points) and Reruhi Shimizu (252.2) finished ninth and 10th, respectively. 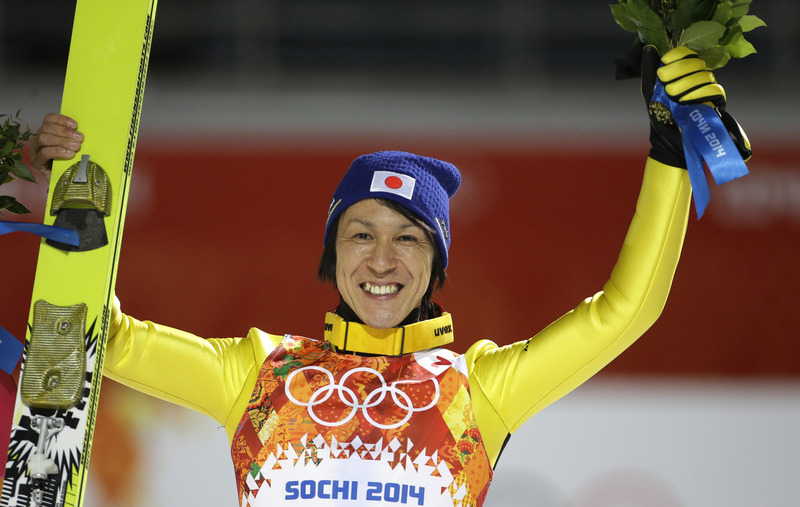 Kasai’s medal is the fifth overall in Sochi for Japan. The veteran was firm when questioned about whether he intends to compete at the 2018 Pyeongchang Games.